There are many online tutorials on how to remove a tree on your own. These detailed tutorials offer a way out for those who would like to get rid of a tree but don’t know how to. However, it is important to note that this is not entirely a good idea unless you are dealing with a fairly small tree. The problem with larger trees is that there is a lot of potential for disastrous results. It is therefore important to get a professional to remove the tree. 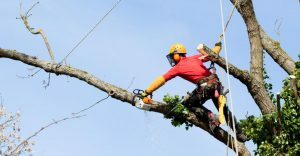 When you choose to have a DIY tree removal process, chances are that you could cause damage or injury. If you live in an urban or fairly suburban area, there are numerous buildings and property all around. The tree could fall on any one of these and cause damage. Whether or not the property is yours, you will need to pay for the damage and oversee repairs. While damage can be extensive, is not as bad as bodily injury. A tree could fall on someone in your compound, the neighbor’s or the walkway. It could also injure pets. This will require a trip to the emergency room which will cost quite a hefty amount. Worse still, the injuries could be fatal. To prevent this, you would need to take a number of safety precautions and don all the safety gear as well. This should be learnt from a professional. Even with the precautions, you still cannot account for all eventualities. Tree removal requires the use of different equipment. If the tree is small, you will just need to buy an axe. If, on the other hand, the tree is larger and you still want to remove it on your own, you might need a chainsaw. This tool is expensive and dangerous since it uses power. It can have kickbacks which could lead to injuries if you are not paying attention or adequately prepared for such a scenario. Additionally, most trips to the emergency room result from falls. Ladders are therefore not the best to use in tree cutting. The option is to hire a crane which is expensive and bulky to move around. The bottom line is that the equipment is expensive. It should also be handled by someone who knows how to use it for the intended purpose. 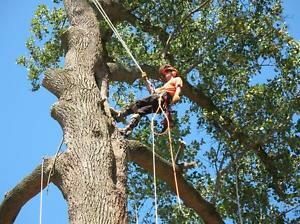 While tutorials show the process of tree removal, it is important to consider that tree removal experts always go through thorough training before they get into the field. If you would like to remove your trees, you should also consider getting some training. This will take some time and cost some money. At the end of the day, it is just best and safest to get a tree removal expert to take down your tree. It is cheaper in the long run since you do not have to account for any damages or injuries. You end up saving money on the equipment you would have had to buy as well.